Not that I have been posting anyways, but we are currently out of town in the Washington D.C. area for a wedding and sight-seeing. I am keeping track of our daily events and will post them when I am home and can organize all my photos! Stay tuned. A few weeks ago I came out to the kitchen in the morning to have this greeting me in our backyard. How nice is that? Behind our property is 17 acres of wooded (well it WAS wooded) privately owned land. There has been talk the last 2 years of it getting clear cut by the owner but nothing has ever seemed to happen. Until NOW. No warning, no nice neighborly notice that there would be heavy machinery in our backyard (okay, it never got to our property but it was right there!). So this was our backyard view up until 3 weeks ago from our patio. It is really sad and seems so unnecessary. The girls have been upset by it and asked all sorts of questions like "where will the owls and woodpeckers live", "don't trees give us oxygen"......... Not much I can say as an answer. So now we move on and try to look at whatever possible positives (though it seems a bit hard to find at times) there may be. We have alot more sunshine coming into the house and backyard, which will be especially nice in the winter. It used to be very dark and dreary. For the third October in a row, Tom gets to build a fence (hoping it can help lessen our view of the ugly mess they have left) Not sure he sees that as a positive though!! The girls can now stargaze from their treehouse and Madison has started her own greenhouse on it thanks to the new sunlight. We are much more fortunate than most of the homes that bordered this property. We still have a decent amount of trees left, due to the fact the former owners never cut any down on our property to do traditional landscaping. Many of the homes have no trees left to shelter the view from the mess. Of course, there are many negatives too, the worst being our concern for how our trees will hold up to this season's upcoming windstorms that we typically get in the winter. I am sure that will make for a few stressful moments in the house. But there isn't much we can do about it (and believe me I tried, and made many phone calls to the county licensing places to make sure it was all legal). So we move on and start some major work to change the landscaping for the backyard. It will take a number of years to get some areas cleared out and finalized but it should be a fun process and I look forward to the final results. Okay, I am so far behind on my blogging, it isn't even funny. 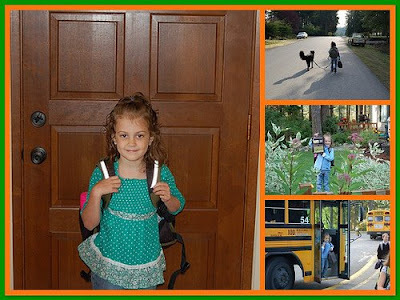 But by waiting 2 weeks I am able to show Madison and Nora's first days of school!! Here is Madison on her first day. It was my first day of work, so Tom got the official duties of getting her ready and putting her on the bus (and then driving behind the bus to the school!). I was so excited to see her walk out of the classroom at the end of the day and to come home to take a peek at the photos! She seems to be having a good time at school, though she has had a few weepy moments in the morning. I think the adjustment to full day school will take awhile and it is hard for her to know that mom and Nora are at home all day while she is at school. Nora's first day photo is a bit harder to show. Her preschool has a VERY gradual start to the year. So I am not sure if her first day would technically be the playdate 3 weeks ago, the teacher visit 2 weeks ago, the one-hour "practice class" last week or next week whe we officially start our "normal" schedule of 2 days a week for 2 hours each day!! 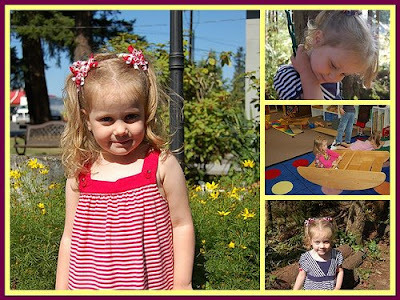 So here are some pictures I have taken from a few of the past few weeks on her preschool days. She is enjoying it and excited to get going. And, yes, I had my first day too! I am teaching some classes at The Little Gym. Overall, I am enjoying it and the 8 hours a week seem about perfect. Enough to get out of the house and do some work, but not enough to make me feel disconnected from home. There is a bit of juggling and scheduling issues to take care of but nothing too bad. Yeah, I am still here! Life has just gotten CRAZY BUSY with Madison starting school, me starting my job, along with coaching Madison's soccer team, co-op preschool meetings........ I have so many entries I want to create, it is just a matter of finding some time to do it! So Katy over at SycamoreStirrings gave a challenge for this week's Muffin Tin Monday. It was "Children's Literature" how fun is that??? I had all sorts of thoughts running through my head but finally settled on Mouse Paint by Ellen Stoll Walsh. Nora's muffin tin transformed into a paint pallette with yogurts that we tinted with the 3 primary colors. She then got to mix the yogurts to create the secondary colors and then had a great time dipping strawberries and graham crackers into the creations! And, if you didn't all ready know, Katy is starting an exciting adventure with her family! They are moving to Luxembourg!!! I am so excited to read all of her posts on all the great things she will be doing. She all ready has posts up from her visit a few weeks ago. Maybe, if I am really lucky, we can even go visit her and get some free room and board!!! So, good luck Katy! I am sure the next few months are going to be hectic and crazy but this is such a wonderful opportunity that will create so many life-long memories for you and your girls!! !